40 | TH E M R EP O RT Mortgage Contracting Services, LLC (MCS) is a national mortgage services company founded in 1986. Services include property inspections, property preservation, REO property maintenance, property registrations, HOA and utility services, valuations services, steel security products, and other mortgage-related services in all 50 states. The success of MCS is the result of its continuous focus on building long-term relationships with clients based upon trust and integrity. 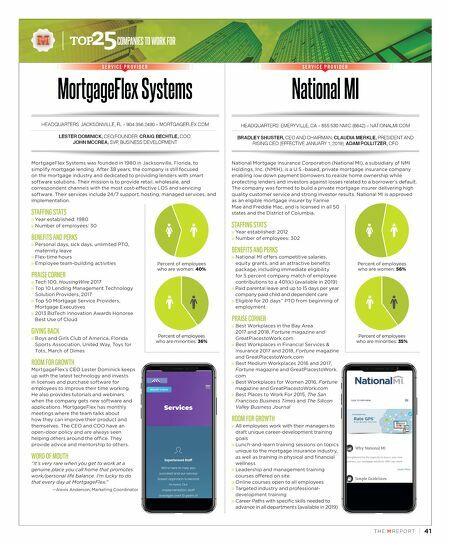 MCS is trusted by some of the nation's largest and most respected banks and mortgage servicers. STAFFING STATS » Year established: 1986 » Number of employees: 650 » Primary locations outside of HQ: Ruston, Louisiana; Tampa, Florida BENEFITS AND PERKS MCS offers flex-time benefits that allow employees to choose a work schedule that best fits their life. Full-time employees can arrive at the office anytime between the hours of 7:00 a.m. and 8:30 a.m., allowing departure times between 4:00 p.m. and 5:30 p.m. This allows employees to personally define their work hours—enabling them to maximize their personal time. MCS values employee wellness and is working to ensure that employees have the company's full support in leading a healthy lifestyle. Some of MCS' wellness initiatives include: health fairs, flu-shot clinics, smoking- cessation programs, friendly weight-loss challenges, and seminars on healthy living. MCS also has fresh fruit delivered to the office to encourage employees to choose a free, healthy snack. MCS is committed to supporting veterans' organizations, as well as organizations for police, firefighters, and first responders. Employees look forward to the events that MCS schedules throughout the year where they can volunteer, show their support, or help raise funds for one of these deserving groups. They have family events such as MCS Walk for Heroes, on-site festivals/ picnics, fundraisers for local military groups, and special speaking events where employees have an opportunity to hear from the organizations that MCS is helping. PRAISE CORNER » CEO Caroline Reaves recognized as a 2018 Women of Influence » Kim Drake-Loy, MCS General Counsel and Chief Compliance Officer, recognized as one of the Top 25 Women in Law by DS News in 2018 Percent of employees who are women: 60% Fiserv has been a trusted fintech leader and innovator for more than 30 years. It's what fuels the company's passion for being partners in possibility with its clients, and for providing innovative solutions and expertise that help clients deliver financial services experiences in step with the way people live and work today. STAFFING STATS » Year established: 1984 » Number of employees: Approximately 24,000 » Primary locations outside of HQ: Alpharetta, Georgia; Lake Mary, Florida; Dallas, Texas BENEFITS AND PERKS » Flexible work-arrangement program that allows associates the opportunity to work from home or another approved location, or work a schedule that differs from traditional business hours » Commuter benefits that allow associates to set aside pretax dollars to pay for eligible commuting expenses, including public transportation, vanpools, commuter highway vehicles, and parking » Wellness program and incentives PRAISE CORNER » Fortune ® —World's Most Admired Companies ® 2014, 2015, 2016, 2017, 2018 » IDC Financial Insights—Top 10 FinTech Rankings 2014, 2015, 2016, 2017 » Fortune ® 500 2016, 2017, 2018 » Top 100 Company for Remote Jobs by FlexJobs GIVING BACK » Through its program, Fiserv Gives Back, Fiserv donates based on the values of the company and supports four key areas: financial literacy, health and wellness, environmental stewardship, and education. 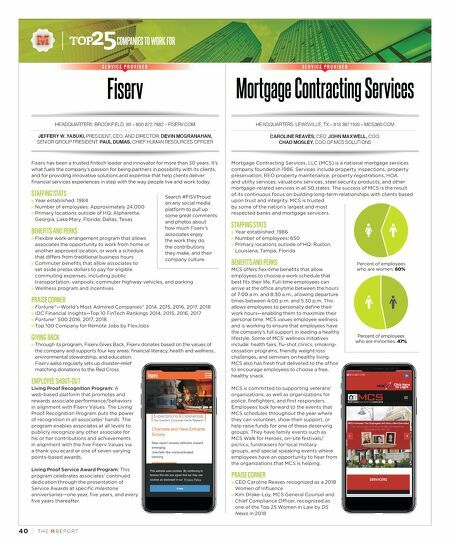 Fiserv aalso regularly sets up disaster-relief matching donations to the Red Cross. EMPLOYEE SHOUT-OUT Living Proof Recognition Program: A web-based platform that promotes and rewards associate performance/behaviors in alignment with Fiserv Values. The Living Proof Recognition Program puts the power of recognition in all associates' hands. The program enables associates at all levels to publicly recognize any other associate for his or her contributions and achievements in alignment with the five Fiserv Values via a thank you ecard or one of seven varying points-based awards. Living Proof Service Award Program: This program celebrates associates' continued dedication through the presentation of Service Awards at specific milestone anniversaries—one year, five years, and every five years thereafter. HEADQUARTERS: BROOKFIELD, WI » 800.872.7882 » FISERV.COM JEFFERY W. YABUKI, PRESIDENT, CEO, AND DIRECTOR; DEVIN MCGRANAHAN, SENIOR GROUP PRESIDENT; PAUL DUMAS, CHIEF HUMAN RESOURCES OFFICER HEADQUARTERS: LEWISVILLE, TX » 813.387.1100 » MCS360.COM CAROLINE REAVES, CEO; JOHN MAXWELL, COO; CHAD MOSLEY, COO OF MCS SOLUTIONS Fiserv Mortgage Contracting Services S E R V I C E P R O V I D E R S E R V I C E P R O V I D E R Percent of employees who are minorities: 47% Search #FISVProud on any social media platform to pull up some great comments and photos about how much Fiserv's associates enjoy the work they do, the contributions they make, and their company culture.